Jack Granatstein & Nathan Greenfield, originally uploaded by johnwmacdonald. 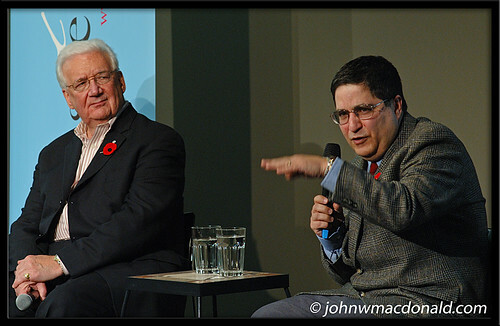 11 November 2007 at Library and Archives Canada. An Ottawa International Writers Festival event. An evening with two of Canada's most respected military historians on Canada's contribution to the First World War and Canada's military in the 21st Century. In Baptism of Fire, Nathan M. Greenfield turns his formidable storytelling skill to one of the defining battles of the First World War and a seminal event in the building of our country. The Second Battle of Ypres pitted the highly trained German soldiers - armed with the first weapon of mass destruction, chlorine gas - against the 1st Canadian Division, which had been in the trenches for just over a week. Yet it was the Canadians who ultimately triumphed, stopping the German advance that followed history's first poison-gas attacks. Greenfield explains how the untried Canadians, with their defective Ross rifles, breathing through urine-soaked handkerchiefs, successfully made one of the most important stands of the war - perhaps even staving off an ultimate German victory. Jack Granatstein's book, Who Killed Canadian History? includes a hard-hitting, timely clarion call to arms, which argues that Canadians’ once-vaunted role of peacekeeping is no longer relevant in a post-9/11 world, since recent missions, from Somalia to Kosovo to Afghanistan, are akin to war. Granatstein also takes Canadian attitudes to task, criticizing our increasing reluctance to support a military presence in countries such as Afghanistan.